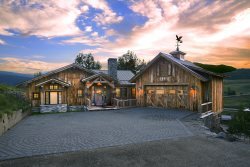 Walk to the slopes, a private ski locker, heated underground parking, a hot tub, and views of Mt. Crested Butte to boot! With all Black Bear 205 has to offer it’s sure to be a family favorite. Park your car in the spacious heated garage and take the elevator up to your new home away from home. Once inside this condo you immediately feel warm and relaxed. The owners have gone to great lengths to make sure your vacation is a great one! Kick off your shoes and step into the main living area with granite and stainless kitchen, bar seating, and light filled living room. There is a dining table and plenty of comfy seating to watch a movie or curl up in front of the gas fireplace. There is a door to the outside deck where you can sit in the Adirondack chairs and enjoy the views of Mt. Crested Butte. The master bedroom has a queen bed, access to the deck, and private en suite bath. Down the hall you will find a junior master with queen bed and en-suite bath. The third bedroom has a set of comfy twin beds and has it’s own full bath just outside it’s door in the hallway. Outside the condo it’s just steps to the hot tub and grilling area for cooking up steaks and relaxing! During ski season the private ski locker just for your family in the lobby means you won’t have to lug all the gear up in the elevator at the end of the day. Located just across the street from the Westwall lift means easy ski access in the winter and hiking right out your doorstep in the summer. The free shuttle stops right outside within site of the condo for those dining and shopping needs downtown. So if you are looking for a luxury condo retreat with all the amenities then look no further than Black Bear 205! It was excellent. Will stay here again! Our family and daughters were super excited and happy with the Christmas Tree setup for our arrival, thank you. Also, the condo did not have humidifiers or locker keys. We called guest services and this was corrected the next day. I do not remember the man's name who brought the humidifiers and keys to our room but he was very friendly and helpful. Overall, we were very pleased with the property and would stay there again. Very well appointed, clean, great mountain views. Hot tub was always at a nice hot temperature. Grills are in a great location. Heated garage a plus. Just a minor constructive criticism. the noise level from people above was quite high as they and their children were constantly walking around in their ski boots. The kitchen had everything we needed and was very well outfitted. When we arrived, there were no parking passes. I called and two passes were quickly delivered to our condo. I also emailed to ask for an early check in, which was promptly granted. This was a great condo for our family! We loved the sleds and boot dryer in the closet!